Last week, we took a look into the future of EDM, painting a most interesting landscape for this upcoming year in electronic music. We believe we&apos;ll see a shift to the more cultured side of the electronic world, where most of this music was originally taken from in the first place. One of the mentioned revolutionaries, and most original acts in the game, was featured in this article for their sound known as Electric Pow Wow, a sound that&apos;s been built up by Canadian production trio A Tribe Called Red. I for one support not only their music, but their cause, as they fight for fairness and equality in a world where the term "redskin" still has not been outlawed, and a music industry still largely represented by white males, when the backbone of it is everything but. If you&apos;re not on it, check out their Nation II Nation LP from earlier this year. 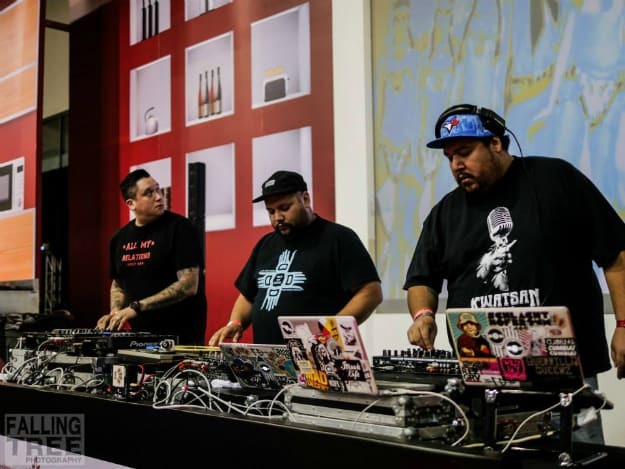 Their sound is a mixture of instrumental hip-hop, reggae, moombahton, and dubstep-influenced dance music with elements of First Nations music, particularly vocal chanting and drumming. Once you grab a listen, you&apos;ll be an instantaneous fan, that is if you have a taste for a flavor exciting and new, breaking barriers that have been up for way too long. Breaking barriers and crossing borders, of the cross continental variety, ATCR is heading overseas for a UK tour plus one show in France. A number of the shows are FREE, so if you are in the area, make sure you get to the club, or local pub, to see these guys. Don&apos;t miss the British Invasion of these three Native Americans from Canada. Please see the tour dates below, or click here for more info about the tour.